Ancient river-like features called valley networks carve the surface of Mars, as seen in the image above of the Parana Valles, which cuts across a region roughly the size of California. The images below show results from computer models used to simulate erosion of the valleys under different climate scenarios. A climate similar to that of Earth's deserts, with intermittent floods and long dry spells, reproduces the valley networks (image C, above). 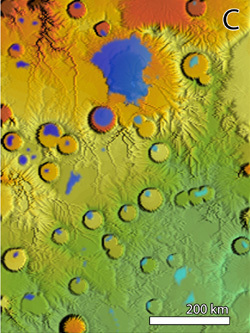 Another scenario, with intense deluges over a short period of time, produces landforms not seen on Mars, such as breaches of crater rims (image D, below). Images by C. Barnhart. A new study suggests that ancient features on the surface of Mars called valley networks were carved by recurrent floods during a long period when the martian climate may have been much like that of some arid or semiarid regions on Earth. An alternative theory that the valleys were carved by catastrophic flooding over a relatively short time is not supported by the new results. 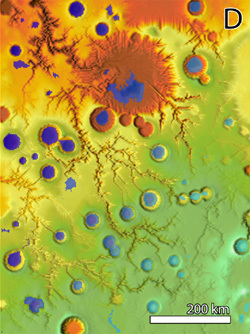 Often cited as evidence that Mars once had a warm environment with liquid water on the surface, valley networks are distinctive features of the martian landscape. In the new study, researchers used sophisticated computer models to simulate the processes that formed these features. "Our results argue for liquid water being stable at the surface of Mars for prolonged periods in the past," said Charles Barnhart, a graduate student in Earth and planetary sciences at the University of California, Santa Cruz. Barnhart conducted the study as a Graduate Student Research Program scholar at NASA Ames Research Center, working with NASA planetary scientist Jeffrey Moore and Alan Howard of the University of Virginia. A paper describing their findings has been accepted for publication in the Journal of Geophysical Research--Planets and is currently available online. "For several decades, scientists worked to determine whether or not there had ever been precipitation on Mars. Only in the last 10 years has NASA acquired high-resolution topographic data that cinched the case for massive ancient erosion from precipitation and runoff," Moore said. Scientists estimate that the valley networks on Mars were carved out more than 3.5 billion years ago. Studies based on climate models have suggested that catastrophic events such as asteroid impacts could have created warm, wet conditions on Mars, causing massive deluges and flooding for periods of hundreds to thousands of years. 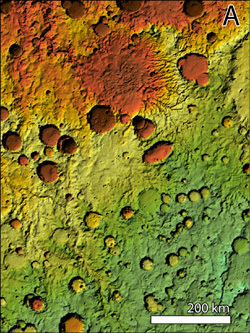 But the new study shows that those conditions would result in features not seen in the martian landscape, because water would accumulate inside craters and overflow, carving exit breaches that cut through the crater walls, Barnhart said. The researchers used a landform evolution model to simulate how the surface of Mars would evolve under different climate conditions. They ran more than 70 simulations under varied conditions and performed statistical analyses to determine which yielded the best match to the observed topography of martian valleys. The results suggest that valley networks formed on Mars during a semiarid to arid climate that persisted for tens of thousands to hundreds of thousands of years. Episodic flooding alternated with long dry periods when water could evaporate or soak into the ground. Rainfall may have been seasonal, or wet intervals may have occurred over longer cycles. But conditions that allowed for the presence of liquid water on the surface of Mars must have lasted for at least 10,000 years, Barnhart said. "Precipitation on Mars lasted a long time--it wasn't a brief interval of massive deluges," he said. Note to reporters: You may contact Barnhart at (831) 459-1784 or barnhart@es.ucsc.edu.